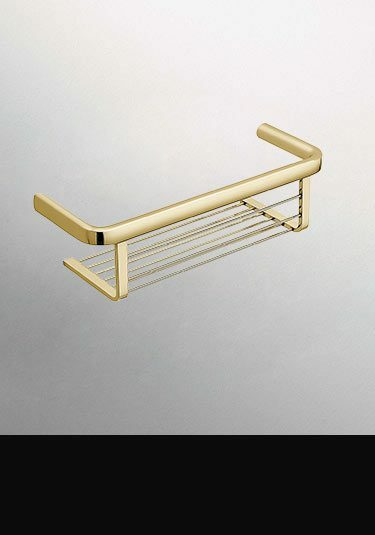 A beautiful collection of designer and luxury shower accessories in chrome and gold plated finishes onto a superior solid brass body. Within this luxury shower accessory range we can supply small and large shower baskets in square, rectangular and corner designs. 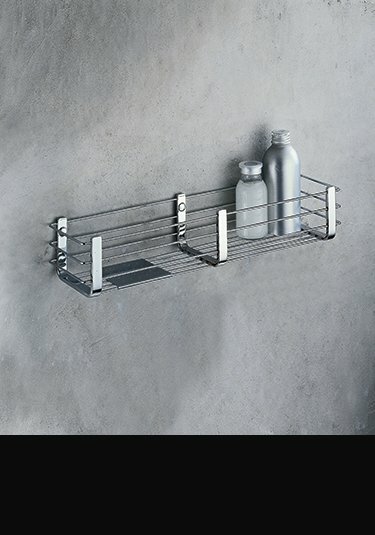 We have shower shelves, hand rails, towel storage racks and folding shower seats. Our corrosion free shower accessories are all guaranteed for at least 10 years but are designed to last a lifetime. These accessories are so good we have never had a corrosion warranty claim in the many years of selling this product. 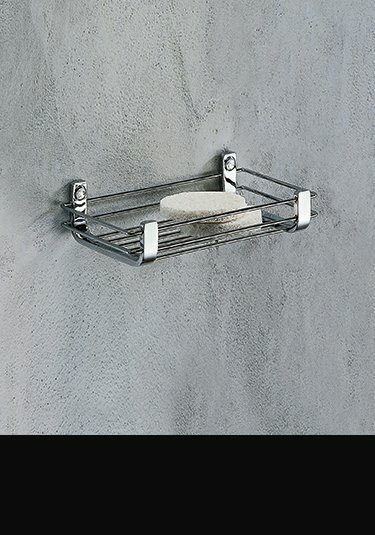 This small rectangular wire shower basket is chrome on brass made, so no rusting. 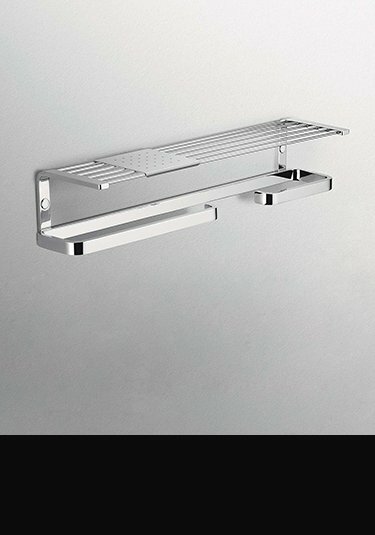 This best quality shower accessory is European made and has a 10 year guarantee. 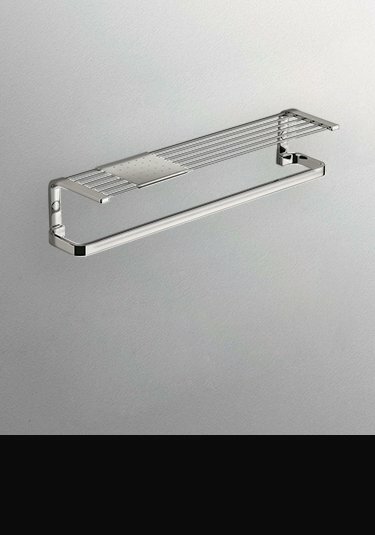 A corner shower basket made in brass with a chrome finish, so the highest quality without any rusting issues. These top quality shower baskets are European made and supplied with a 10 year guarantee. A medium sized rectangular shower basket in lovely contemporary styling. 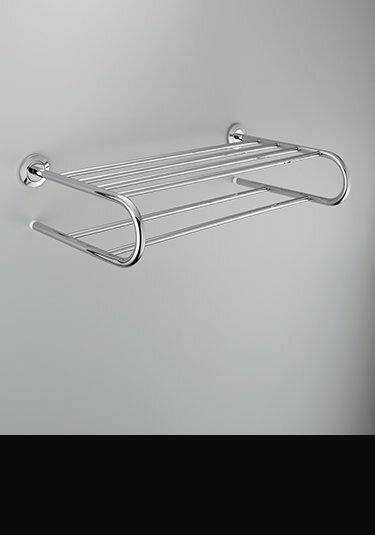 These shower storage baskets are chrome on brass manufactured therefore no corrosion issues. Each basket is guaranteed for 10 years. 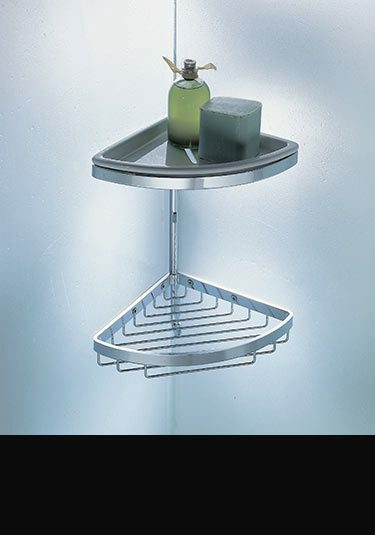 Large double shower basket for easy tidy storage in the shower. These baskets are made of chrome onto solid brass allowing no corrosion issues and longevity of service. 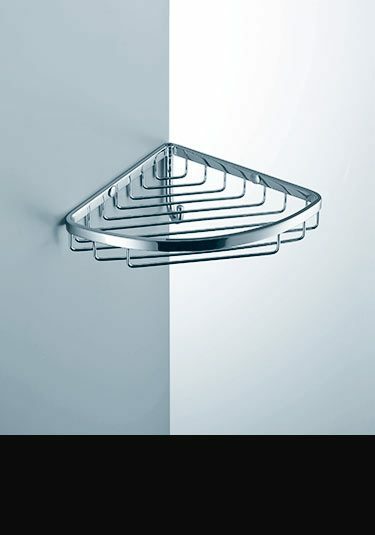 Large offset shower baskets manufactured in Europe in brass with a chrome finish. 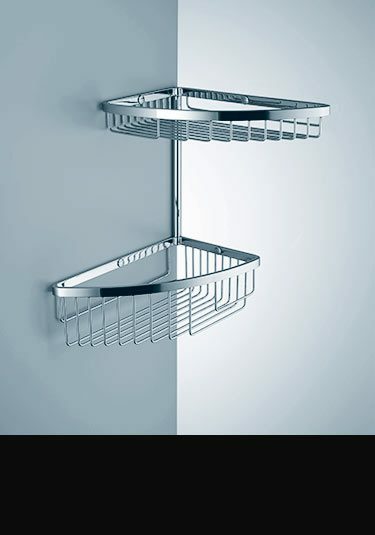 These shower storage baskets are completely rust free and will last a very long time. Supplied with a 10 year guarantee. A luxury corner double basket with a handy underneath hanging hook for shower gels etc. Made in solid brass with a chrome finish ensures longlife without any rusting issues. Made in Europe with a 10 year guarantee. 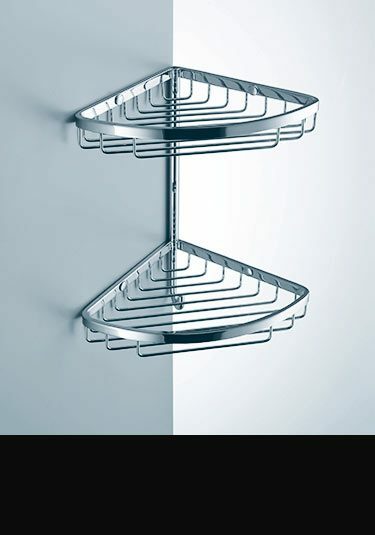 Lovely quality double basket for corner of the shower fitting. 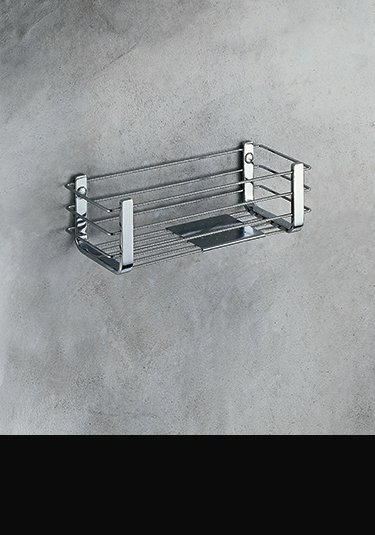 This luxury quality shower storage is manufactured in solid brass with a thick chrome finish, giving longevity of service without corrosion issues. Supplied with 10 year guarantee. 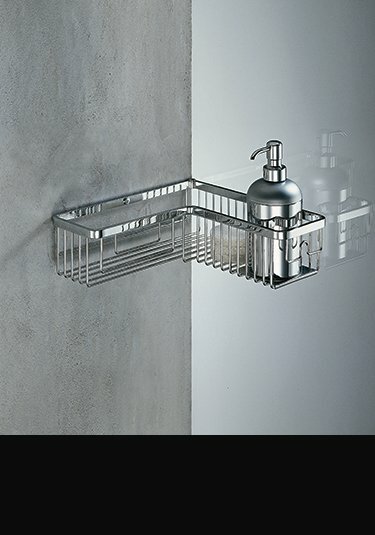 A contemporary cubic styled shower basket in chrome. This luxury shower storage is made in Europe in solid brass and will not rust. Therefore supplied with 10 year guarantee. 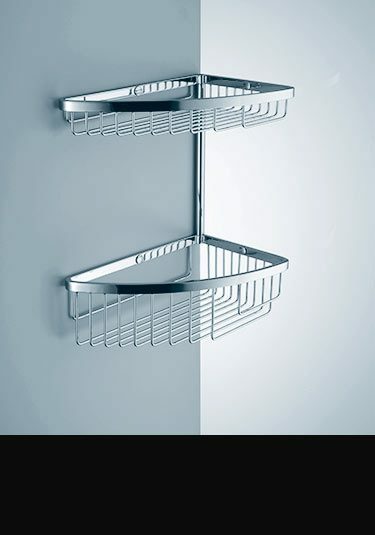 Beautiful quality shower storage with a handy hanging rail. 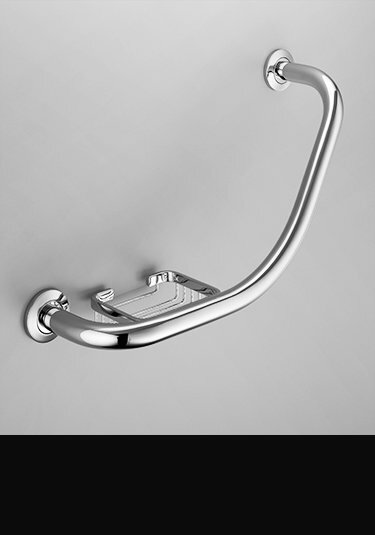 This luxury shower accessory is made of brass with a thick chrome plating and will not corrode. 10 years guarantee. Lovely quality shower baskets with a chrome plated finish. These shower accessories make ideal shower storage. Supplied with 10 year corrosion free guarantee. A strong wall mounted hand grab rail in a contemporary style. 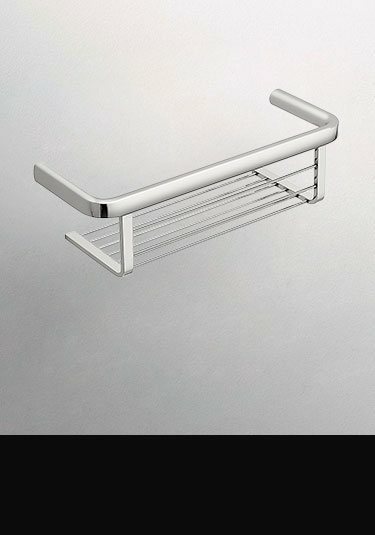 These bath hand rails have an intergrated soap storage and are an attractive addition for shower and baths. German manufactured folding shower seat in engineered quality. 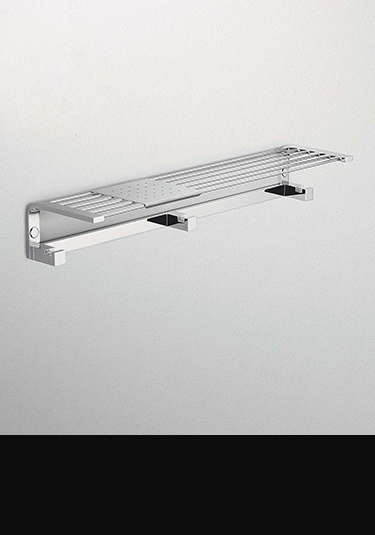 Each shower seat has strong wall brackets and folding mechanism. The seat is supplied in a black or white soft rubberised material with a matching back rest as an optional extra. This small folding shower seat with strong wall brackets and folding mechanism is German manufactured ensuring quality and longevity. 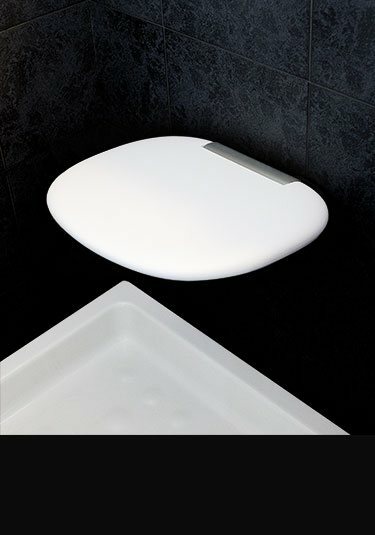 A high quality designer shower seat that folds away when not in use. This Italian made seat is supplied in white with a 10 year guarantee.